Ahmed's novel is set during the industrial revolution and explores the sense of tremendous change it created, both exhilarating and frightening for the ordinary people. 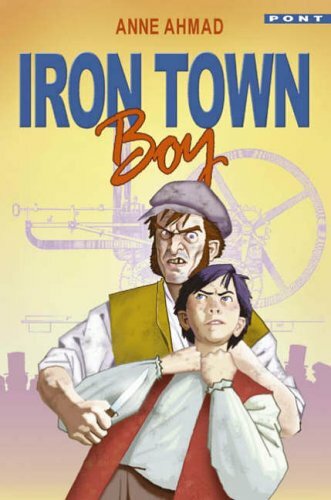 We see the world through the eyes of Gwilym, a young Welsh boy, recently orphaned, who leaves the turf hut which has been his home all his life to find work in the growing metropolis of Iron Town. The book is packed with information - from details of the process involved in producing iron to the effectiveness of willow as a tooth brush while Gwilym even gets to ride with John Trevithick on the maiden journey of his steam locomotive. This would be a very useful book for any child studying the industrial revolution, and an additional plot in which Gwilym foils an attempted robbery adds drama. Characterisation is weak though and for all his adventures Gwilym fails to come alive as a character.